Need a side for your night of grilling? 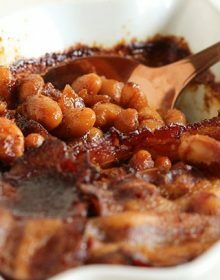 Create these delicious Barbecue Baked Beans! In a large sauce pan, render the bacon until slightly crisp over medium heat. Transfer the bacon to a plate and add the onion to the bacon fat. Cook the onions until softened and add the garlic. Cook for 1 minute. Stir in the bourbon and coffee, continue cooking until reduced by half. Approximatley 1 minute. Add the molasses, ketchup, brown sugar, vinegar, chili powder and allspice. Bring the mixture to a boil and stir in the beans. Season with salt and pepper to taste. Turn off the heat. Coat a 9 inch baking dish with cooking spray. Carefully pour the beans into the baking dish and top with the strips of bacon. Bake for 45-50 minutes or until the sauce is thick and syrupy. Allow to rest for 5-10 minutes before servings.